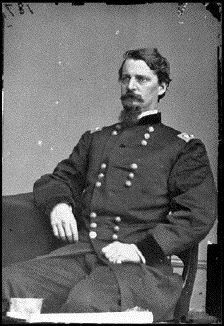 Winfield Scott Hancock commanded II Corps, Army of the Potomac. He had a reputation for being the best general and the best cusser in the Union Army. On 1 July, George Meade ordered him to turn II Corps over to John Gibbon and go to Gettysburg to take operational command of the Union forces consisting of I Corps, under Abner Doubleday after John Reynold's death, and O. O. Howard's XI Corps, with Daniel Sickles's III Corps coming up. Howard rankled at Meade's order because, although he and Hancock were promoted to major general on the same day, Howard had been a brigadier 28 days before Hancock, and thus ranked him. Howard probably did not know that Meade believed that Secretary of War Edwin M. Stanton and General-in-Chief Henry Halleck gave him the latitude to appoint commanders in an emergency, without regard to military hierarchy. Settling into a truce, Hancock and Howard managed to work together during the fighting in the late afternoon, with Howard responsible for dispositions to the east of the Baltimore Pike, and Hancock to the west. When Henry Slocum and XII Corps arrived, Hancock turned over command to Slocum, and rejoined II Corps, located to the south and east of Culp's Hill, about 3 miles (5 km) from Gettysburg. During the Second Day, Hancock was given control of the center of the Union line on Cemetery Ridge. After Sickles was wounded, Hancock's operational command was extended to III Corps. In one well-known incident, Hancock ordered the 1st Minnesota to blunt Cadmus M. Wilcox's Alabama Brigade of Richard Anderson's Division of A. P. Hill's III Corps. While the 1st MN suffered 82% casualties, they bought the Federals some much needed time giving them the opportunity to bring up reinforcements for III Corps. As the fight on the Union left was winding down there was still considerable action on Culp's Hill on the right. Earlier in the day, Meade had ordered Slocum to move from Culp's Hill in order to help reinforce the left. Hancock, fearing that this had seriously weakened the right, on his own initiative ordered Gibbon to send two brigades from II Corps to Culp's Hill. On the Third Day, Hancock's II Corps, in the center of the Union lines, bore the brunt of the fighting during James Longstreet's assault with the divisions under George Pickett (I Corps, ANV) and James J. Pettigrew and Isaac Trimble (III Corps, ANV). Hancock was wounded during the assault but refused to be carried from the field until the results were clear. The wound never healed properly, and bothered him for the rest of his life. In 1880, Hancock ran for President on the Democratic ticket, opposing the Republican nominee, James A. Garfield. Garfield won the election with a margin of 10,000 popular votes.